Array of import and output formats for model exchange. Export diagrams into image files for sharing with your colleagues and stakeholders. We support image formats like JPG, PNG, SVG and EMF. Export diagrams into PDF file, which contains diagrams in scalable vector-based graphic format. XML facilitates information system to share data. You can output your project or some diagrams in project to XML, and import in another project. Select shapes in diagram and copy them as JPG or EMF. Immediately paste to external document editors like MS Word. Print software design from the highly configurable print previewer. You can adjust header, footer, page margin, layout, etc. for the printout. Export selected diagram to a new Visual Paradigm project file and perform external changes. Import external project content into the active project through the project importing feature. Perform mass editing of project data with Excel. 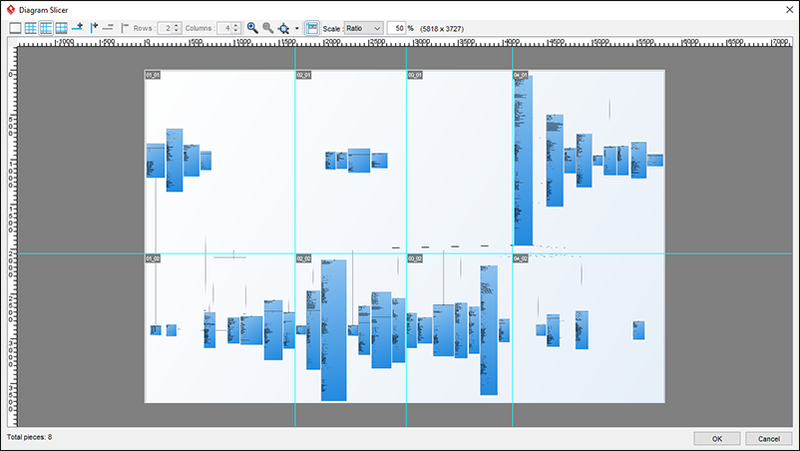 Export diagrams and model elements to Excel, edit their names and properties and then import the changes back to Visual Paradigm. Export your model into OMG XML Metadata Interchange (XMI) format. Import is supported, too. Export your model into Eclipse UML2 XML format. Import is supported, too. Carry on workflow design by importing legacy design from Visio drawing (.vdx). Re-use Visio stencil through the import Visio stencil feature. Carry on system modeling by importing legacy design from Rational Rose model (.mdl). Carry on software design by importing legacy design from Rational DNX (.dnx). Carry on process design by importing legacy design from Rational System Architect (.xml). Carry on software design by importing legacy design from Rational Rhapsody (.rpy). Carry on software design by importing legacy design from NetBeans 6.x UML.